INBOX: BUDGET — The Trump administration will release the first of two waves of budget documents this week, reportedly to contain large-scale proposals, with specific policy details coming next week. Overall, the Trump administration will seek to increase defense spending while cutting non-defense programs by 5 percent, representing “one of the largest spending reductions in history,” Russ Vought, acting director of the Office of Management and Budget, wrote in an op-ed last month. Cuts to the Education Department, included in the broad non-defense discretionary bucket, would not be new for the administration. For the past two years, Trump has sought massive cuts to K-12 spending, including eliminating afterschool programs and teacher training grants, while at the same time proposing new school choice programs. The White House also may use the budget release to unveil new executive orders for higher education, including one that would make federal research dollars contingent on, in Trump’s words, protecting free speech, Inside Higher Ed reported. Presidential budget proposals, particularly Trump’s, are largely symbolic and usually don’t become law. The Democratic majority in the House makes it even less likely. ICYMI: SPECIAL ED — A federal court in Washington, D.C. last week ruled that the Education Department cannot delay implementation of the Obama-era “Equity in IDEA” rule that required states to ensure that children of a particular race are not over-identified for inclusion in special education, nor disciplined differently. 2020 WATCH: Former Colorado governor John Hickenlooper is the latest to join the Democratic field. (Check out his conversation with The 74 at a governors’ education event last year.) Washington Gov. Jay Inslee also declared his candidacy last week; Inslee opposed charter schools but has not stood in the way of laws that let them survive in the midst of legal battles. TUESDAY: CHILD NUTRITION — A House Education and Labor subcommittee holds a hearing on federal child nutrition programs and “growing a healthy next generation.” The federal law authorizing those programs, including school breakfast and lunch and summer meals programs, has been due for reauthorization since 2015. TUESDAY: PTA — The Parent Teacher Association holds its annual legislative conference Tuesday through Thursday, with a focus on federal policy and school finance, special education, school safety, and student data and outcomes. 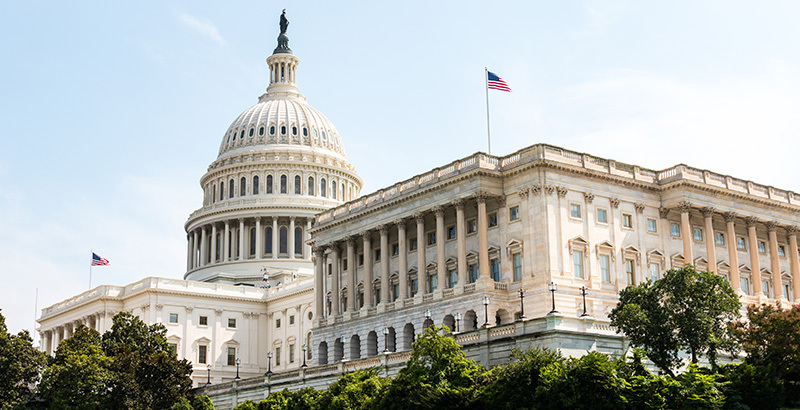 TUESDAY: FAFSA SIMPLIFICATION — The Senate Health, Education, Labor and Pensions Committee holds a hearing on simplifying the FAFSA. Both Sen. Lamar Alexander, the committee chair, and Sen. Patty Murray, the ranking Democrat, have discussed their priorities for reauthorizing the Higher Education Act. TUESDAY: FOR-PROFIT COLLEGES — A House Appropriations subcommittee examines oversight of for-profit colleges. The Education Department’s inspector general has warned Congress about the department’s efforts to roll back regulations on those schools, and the issue is sure to be the subject of contentious debates when it comes to reauthorizing the Higher Education Act. TUESDAY: NET NEUTRALITY — A House Energy and Commerce subcommittee holds a hearing on a legislation to restore net neutrality rules, which Democrats are calling the Save the Internet Act. Education groups have raised concerns that the FCC’s 2017 decision to end the rules could lead to higher prices and slower service for internet in schools. WEDNESDAY: INDIAN EDUCATION — The Senate Indian Affairs Committee holds a hearing to examine the status of programs for Native Americans included on the Government Accountability Office’s 2017 “high-risk list.” One was the Bureau of Indian Education, specifically its mismanagement of spending and facilities. The agency remains on the 2019 high-risk list and has “partially met” all the GAO’s criteria for assessing risk. WEDNESDAY: COLLEGE COSTS — The House Education and Labor Committee holds a hearing on college costs and “student-centered reforms to bring education within reach.” Committee leaders announced last month that they will hold five bipartisan hearings as Congress works to reauthorize the Higher Education Act. WEDNESDAY: HHS BUDGET — A House Appropriations subcommittee examines the Department of Health and Human Services’ fiscal 2020 budget request. Among the department’s responsibilities are the Head Start preschool program for low-income children and care of migrant children on the southern border. WEDNESDAY: CYBERSECURITY & CTE — The Brookings Center for Technology Innovation hosts a discussion on cybersecurity education, including presentations by Rep. Glenn Thompson, Republican of Pennsylvania, and Rep. James Langevin, Democrat of Rhode Island, the co-chairs of the Congressional Career and Technical Education Caucus. THURSDAY: MEMBER DAY — The House Education and Labor Committee holds a “member day” at which any lawmaker may come and talk about his or her priorities for education and labor issues. FRIDAY: FREE COLLEGE — Centrist Democratic think tank Third Way hosts a panel discussion to “dig beneath the headlines” on free college, specifically details like which students benefit the most.